“…In the Ismaili tradition, al-Qāḍī al-Nuʿmān is the most famous author…He debated this Ḥanafī jurist about ijtihād and thought that he’d won, and then he heard afterwards that the man had written a fascicle still arguing his point against al-Qāḍī al-Nuʿmān. So then he thought: I really need to write a serious refutation to put an end to this…” — Professor Stewart, Emory College, Atlanta, USA. M. Lynx Qualey, an Arabic literature blogger based in Egypt, conducted an interview with Professor Devin Stewart of Emory College on the Fatimid jurist Qadi al-Nu’mān, who served four Ismaili Imams for more than sixty years. The interview is based on Disagreements of the Jurists, one of the foundational legal texts of Ismaili Islam, which was translated recently by Dr. Stewart. Among other interesting matters, Qualey asks Professor Stewart about why al-Nu’mān’s book is important in understanding Islamic legal traditions and the Fatimid Empire, why medieval scholars thought it was classier not to cite their sources, and why a minority tradition would feel the need to conform to the shape of the majority….Read the interview. Please read the PDF version of this article in History Compass at the Wiley Online Library by clicking on the above image or http://onlinelibrary.wiley.com/doi/10.1111/hic3.12210/pdf. Abstract (from History Compass): The Fatimids have been consistently studied as powerful contenders in the commercial and political control of the Mediterranean Sea. 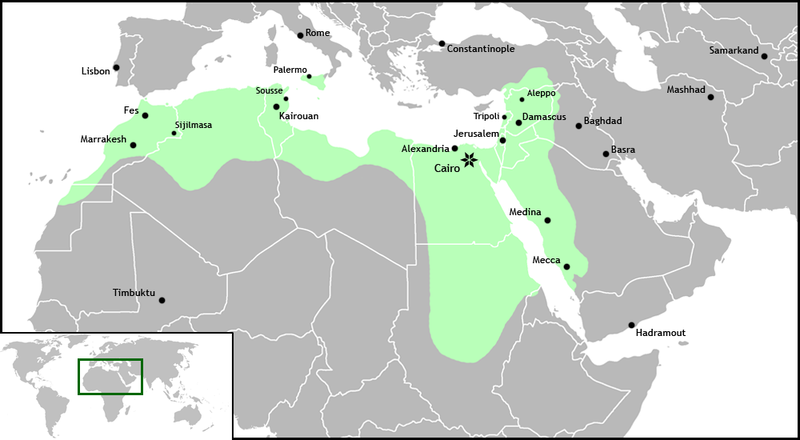 It is therefore surprising to find that only passing attention has been paid so far to the use of the Nile the Fatimids made as the ‘avenue’ through which goods from Africa and the Indian Ocean could be transported from Upper Egypt, to Cairo, then Alexandria and from there distributed to other Mediterranean ports. My argument in this paper is that the imperial aspirations of the Fatimids in Cairo and beyond were in many ways dependant on the unpredictability of the natural cycles that are characteristic of the river to this day but also on the Fatimids’ success or failure in politically and economically managing the varied social, political and trading activities that took place along the Egyptian section of the Nile valley. Beside commercial navigation, throughout the history of Egypt during the Fatimid period, the river was used for transport of people, water supply, the staging of state rituals and parades, as holiday destination for the imam-caliphs and their courts but also as a vehicle through which pilgrims form various regions of the Islamic world continued to penetrate Egypt whilst back and forth on their way to Mecca. Read article in History Compass at the Wiley Online Library. Please click: http://onlinelibrary.wiley.com/doi/10.1111/hic3.12210/pdf. 1970: Mansoor Ladha, veteran award winning journalist, writer and author, interviewing His Highness the Aga Khan for Tanzania’s daily, The Standard (now Daily News). Photo: Mansoor Ladha Collection. Copyright. As a journalist, a writer and an author, what better time to be than reporting milestones and significant events during the Fatimid Period or the “Golden Age” of Ismailism, when Ismaili Imams ruled over a vast empire and when Ismaili literature, philosophy and law flourished. It was during the Fatimid Period that the Ismaili scholars and authors produced what were to become the classic texts of Ismaili literature dealing with a multitude of exoteric and esoteric subjects. I think I might have made Ismaili fiqh (jurisprudence) my area of specialization, because it had not existed during the pre-Fatimid period. It was codified and became catalogued during the early Fatimid period. It was during the Fatimid period that Ismailis made their important contributions to Islamic theology and philosophy in general and to Shia thought in particular. Modern recovery of Ismaili literature clearly attests to the richness and diversity of the literary and intellectual traditions of the Ismailis. 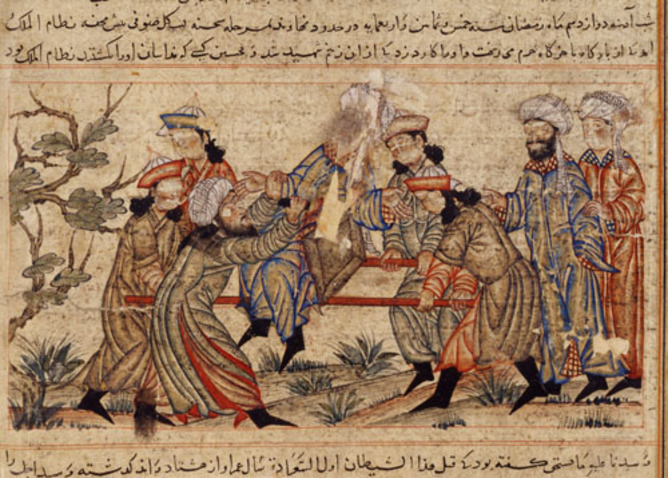 But, I think, for me of all the events that I would have reported, there are a number of related incidents that stand out, and which I would have liked to witness in the company of Imam Muizz’s trusted commander, Jawhar al-Siqilli. He was of Sicilian descent. He had been entrusted by the Imam to conquer Egypt. With a 100,000 men assembled and equipped at a cost of 24 million dinars, he set out for Egypt on February 5th, 969. Embedded I would be, like the modern journalists in this vast army, alongside my hero! The road to Egypt had been well ascertained, forts had been built through the route at specific places. Jawhar was carrying with him a thousand caskets filled with silver. Camels carried gold ingots in plain sight, cast in the shape of millstones, to impress the crowds and the local peoples through which the army passed. Then four months later, in June of the same year, I would arrive with Jawhar in Egypt, and hardly witness any resistance! As the first measures after the conquest, I see him issue a proclamation promising financial reforms and an end to injustice. He reached out to Sunnis, Jews and Christians and offered them protection. Then I had been with him as he crossed the Nile, and on July 6 of the same year, he marched through Fustat, and established himself north of the city in the plain that would become his new capital – a capital that Imam Muizz had expressed a wish would rule the world. This site was empty except for a monastery and a castle. On the very night of Jawhar’s arrival in this empty spot, I would have seen the Sicilian mark the perimeter of the city with wooden stakes strung together with belled ropes. A crow would land on the rope and set the bells jingling. 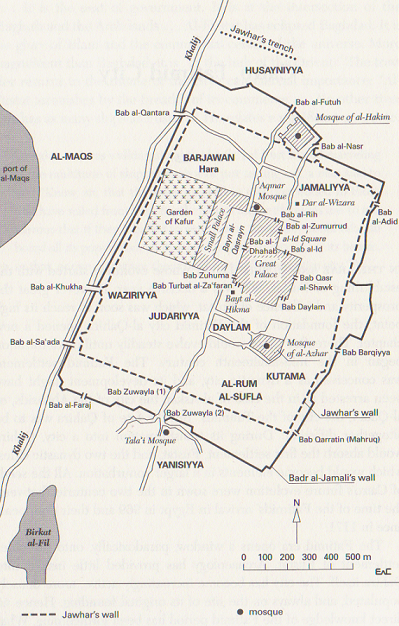 The ground breaking work would commence at that spot for what would eventually become known as al-Qahira (“The Triumphant”). I would see the birth of what is now modern Cairo! Now that all had been done, no further time would be spent. There was nothing left to do but to invite Imam al-Muizz. In 973, the Imam leaves the Maghreb on his way to Egypt with his sons and relatives with him, along with coffins of his ancestors. One of his stops is Alexandria, where the Imam resolves to dedicate his life in the exercise of good works. He then preaches to them in a manner which draws tears from many who are present. He departs after spending three days in Alexandria, and on June 6, 973, he reaches a place known as Mina. Jawhar is there to receive him. I see him go forth to meet his master and I witness him drawing near the Imam, dismounting from his horse and kissing the ground before the Imam in a show of loyalty, humility and submission to the Amirul Muminin. This is affection and love for the Imam I see at the highest and deepest level. It is a profound experience and a joy to behold, which I would report. The Imam would then cross the Nile on the Rawdah bridge, bypass Fustat, and proceed straight to Cairo and take possession of the palace or fort that Jawhar had constructed for the Imam. It is Ramadhan – year AH 362. The feast marking its end is underway. I’d see Imam Muizz conduct his prayers at the new mosque in Cairo, and then ascend the pulpit to give his sermon, with Jawhar on the steps of the pulpit. I would feel the emotions as the crowds weep and sob at hearing the Imam’s sermon. Outside, the Imam would then mount his horse surrounded by his four armoured and helmeted sons, while two elephants led the procession. Destination – the fort, and I on my heels to get there for the Darbar! 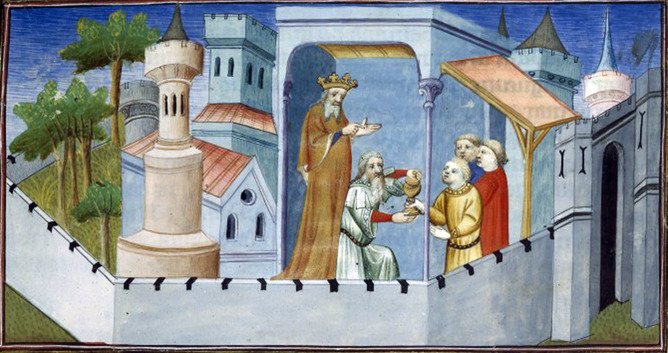 Then, at the fort, all the citizens eagerly await to pay their allegiance to the new Caliph. Jawhar would be within my sight, and very close to the Imam, to his right. I would witness the Imam majestically seated on his golden throne as he received all the nobles, Qadis, Vazirs and Ulemas of his city. They would present the Imam with their beautiful gifts as well as a robe made from a rare yarn that is known to grow only in Tunis. The material has a special shine and is gilded with gold and silver. The Imam would then be presented a Turban of a similar material and he would adorn the robe and the Turban. A resplendent Darbar for me to record and report as a journalist! My friend, Jawhar, would get his turn. I would see him present the Imam, al-Muizz, with the best breed of 150 horses gilded with saddles and bridles of gold and diamonds as well as camels and ponies, saddled with boxes filled with all rare items in Egypt. Then the Imam Muizz in a remarkable gesture of magnanimity and forgiveness would announce the release of about 1000 of his prisoners and present robes and Khalat to all his nobles and officers. Would Jawhar be forgotten in the sight of the Imam? No. I would be exuberant to see my beloved Imam’s immense love for someone responsible for conquering Egypt some four years earlier. Jawhar would be honoured as he is presented with a golden Khalat and a turban. Imam Muizz then would tie a sword on Jawhar’s waist and present him with 20 horses with golden saddles, 50 thousand dinars and 200,000 dirhams. With this Darbar, Egypt and Cairo enter a new era that would last almost two centuries and constitute one of the most brilliant periods in Ismaili history and Islamic Civilization. Indeed a monumental and epochal event to witness and report! What a story and I Wish I’d Been There with Jawhar. About the Writer: Mansoor Ladha is an award-winning journalist based in Calgary, Canada. He has held several senior editorial positions with daily and weekly newspapers in Canada, Kenya and Tanzania, which included the Edmonton Journal, Morinville Mirror, Redwater Tribune, Daily Nation, Kenya, and Daily News, Tanzania. Currently, he freelances for the Calgary Herald, the Vancouver Sun, and the Calgary Senior newspapers and travel magazines. He has also published a book entitled A Portrait in Pluralism: Aga Khan’s Shia Ismaili Muslims and is currently working on memoirs on his life in East Africa and in Canada. Last year, he was one of the several writers, scholars and journalists invited to contribute a chapter in the book called, The Story That Brought Me Here. He has served on several public and voluntary bodies in Canada. His complete profile can be viewed on his Web site www.mansoorladha.ca. This piece by Mansoor Ladha is one of 32 succinct pieces on Ismaili history that appeared in this blog’s highly acclaimed first anniversary special series, I Wish I’d Been There. 2. We welcome feedback/letters from our readers. Please click Leave a comment, or email it to simerg@aol.com. Your feedback may be edited for length and brevity, and is subject to moderation. We are unable to acknowledge unpublished letters. 1. Cairo by Andre Raymond, translated by Willard Wood, published by Harvard University Press, Cambridge, MA, 2000.